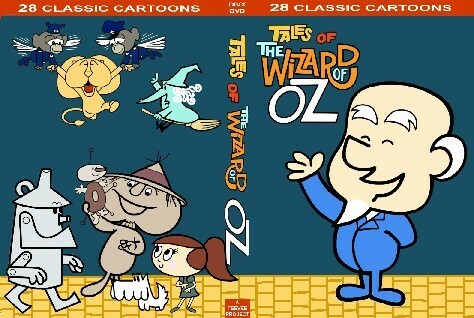 An Animated Adaptation TV series of The Wonderful Wizard of Oz books and the 1939 MGM film, notable as being the first traditionally animated TV series produced by Rankin/Bass Productions (formerly known as Videocraft International). A total of 125 shorts were produced in 1961 and aired in First-Run Syndication, often with its sister series, the stop-motion New Adventures of Pinocchio. What else was notable about this adaptation was giving certain characters names and new personalities. The scarecrow was named "Socrates Strawman", which was an Ironic Name due to him being The Ditz (since he lacked a brain), the tinman was named "Rusty" and was typically a bully and a jerk to others (due to him not having any heart), and the cowardly lion was named Dandy Lion, but remained his usual cowardly self. Usually, they would try to get what they desire from the Wizard, who could actually perform magic (with his specialty being card tricks), or Dorothy and Toto would help them out of a jam, while trying to avoid (and thwart) the Wicked Witch of the West. The animation production was done in Canada by Crawley Films. In 1964, a TV special loosely based on the series was produced, "Return to Oz," (no relation to the Disney live-action film of the 1980s), with refined character designs and a few recast voices. From 2003 to 2005, the series was available on Comcast On Demand. Several episodes can also be found on YouTube. Adaptation Name Change: In the original books, The Tinman's acutual name was Nick Chopper. Here, his name is Rusty. Amazing Technicolor Population: The Munchkins. Amnesia Episode: "The Flipped Lid" involves the Wizard of Oz getting magnesia ("Amnesia! AMNESIA!") when in Topsy-Turvy Town. And then Dandy Lion gets it. Animation Bump: Some episodes have a more "lively" look to their animation and is more detailed, including episodes like "The Fountain of Youth," "The Sound of Munchkins," "Going to Pieces," "The Gusher," "The Hillies and the Billies," "Love Sick," "The Rubber Doll," "Monkey Air Lift," "The Raffle," "The Fire Chief" and "The Poet." Artistic License  Biology: Dandy's mother in "The Sucker" and Lulabelle in "Mail-Order Lover" are seen each with a mane, despite real lionesses lacking them. Asian Speekee Engrish: The titular character in "Chowy Mein" speaks like this. It's even spoofed: he keeps saying "clues" as "crues," and he even spells it out correctly although he still pronounces it as "crues." Beach Episode: "Beauty and the Beach." Beatnik: The Giant of Cloud Nine in "The Flying Carpet," and the "Munchniks" in "The Poet." Beautiful All Along: The titular character in "The Green Tomato" is seen as an outcast by the other tomatoes due to her being green instead of red. Rusty tries covering her in red lipstick to make her look like a red tomato, until a freak rainstorm washes it off. But the rain also helped her grow, revealing she is actually a green pepper! Naturally, this attracts the attention of several male peppers, to the "green tomato"'s delight. Big Eater: Dandy Lion is this in "The Pudgy Lion" and "The Dinner Party." Black Bead Eyes: The majority of characters have eyes like this, except for Dorothy, Socrates Strawman (on occasion), the Flying Monkeys, Desmond the Dragon, and some other incidental/one-off characters. Boxing Kangaroo: Boomer Rang, in his self-titled episode, is an example of this, complete with a stereotypical Australian accent and boxing gloves. Cast as a Mask: Initially averted in "Double Trouble," when the Wicked Witch transforms herself into a Rusty Tinman clone to cause trouble with Socrates and Dandy, due to Rusty and the Witch having the same voice actor. Then played straight at the end, when the Wizard dresses up as Rusty for a masquerade party and perfectly imitates his voice. Cowardly Lion: Dandy Lion, obviously. Darker and Edgier: The Return to Oz special was more serious than the shorts, with the Witch returning to threaten Dorothy and the Silver Slippers being able to turn things to stone. Demoted to Extra: Dorothy is more of a secondary character in this show. She still gets several Day in the Limelight moments, but she's absent from a large number of episodes (she doesn't even appear until the end of the second one), and her attempts to get back to Kansas are more of a Running Gag than anything else. Deranged Animation: Happens from time to time, even with the low animation budgets. It happens even more frequently in the Return to Oz special. Diabolical Dog Catcher: Seen in "The Jail Breakers," which involves such a dog catcher snatching Toto while Rusty Tinman watches over him, and then Rusty and Dandy have to break Toto out of the pound. The Ditz: Again, Socrates Strawman, to the annoyance of others. Early Installment Weirdness: The two-part pilot suggests that the series was going to be done in a narrated serial style, similar to its' sister series, the stop-motion New Adventures of Pinocchio. The series proper abandons this, however. Narrator: From the far corners of this amazing land, three sad souls have come to the Wizard for help. Rusty the Tin Man came for a heart. Wizard: Pick a card, any card! Rusty: I don't want a card! I want a heart, so I can be nice! I wanna be nice! Y'hear me? NICE! Rusty: (screaming in the Wizard's face) NICE AND LOVEABLE! I need a heart so I can be NICE AND LOVEABLE! Narrator: Socrates the Strawman came because he wanted a brain. Wizard: (totally unfazed, turns to Socrates with the cards) Pick a card, any card! Socrates: — is a card! That's what I need, a card! Rusty: No, ya knuckleheaded ninny! (bonks him on the head) You want a brain! Socrates: (dazed) Where did he go, pal, where did he go? Narrator: Dandy, the Cowardly Lion, came looking for courage. Dandy: Oh! Heh heh... hello. Wizard: (gesturing dramatically) Your card is... the Red Queen! Dandy: Oh, no, sir, I'm dreadfully sorry, but it's the Black Jack. (cowers as the Wizard frowns) Oh, I do hope you won't be angry! I'll try to do better next time! Really I will! Rusty: Enough of this nonsense! (turns to the Wizard) You promised to give me a heart! And my friends here a brain and courage! So c'mon with it! Wizard: ...Are you sure you don't want to try and pick a card, any card? Rusty: NOOOOOOOOOOOO! I want a heart! A cuddly, loveable, SWEET KIND HEART! Feuding Families: Seen in "The Hillies and the Billies". Frankenstein's Monster: One of the Wicked Witch of the West's old classmates, Frankie Draculoff, whom she had a crush on. Good Angel, Bad Angel: Done with Rusty Tinman in "Have Your Pie and Eat It Too" and "Too Much Heart." Gravity Screw: This is the main gimmick of Topsy-Turvy Town and its inhabitants. Henpecked Husband: In "Love Sick," the Wicked Witch wants a lover, so she concocts a love potion and disguises herself, and gives the potion to the Wizard, whom goes head over heels for her. But Dandy Lion warns the Wizard that marrying the Witch would be a terrible idea, and they look into the Wizard's crystal ball to see this trope come into play. Hollywood Voodoo: In "The Rubber Doll," the Wicked Witch of the West makes a Voodoo Doll of Robby the Rubber Man, and pricks it with pins. This results in the real Robbie deflating badly, and coming to the Wizard for help. So the Wizard creates his own voodoo doll of the Witch, thus giving her a taste of her own medicine. Jerk with a Heart of Gold: Rusty, the trope name a little ironic twist since he actually lacks a heart. But he perfecty fits the charater type — while bad-tempered, quarrelsome and bossy, he really isn't a bad person; he tries to do right by his friends even if he spends a lot of time shouting at and insulting them. Lethal Chef: Dorothy is seen to be this in "The Dinner Party." Only Dandy Lion initially likes her burnt Crepe Suzettes, until they eventually make him sick to his stomach. Limited Animation: A lot of it, such as shots where only a character's mouth moves, heavy use of Stock Footage, etc. Named by the Adaptation: The Scarecrow and the Cowardly Lion were given the names Socrates and Dandy respectively. The Wizard's voice is clearly based off W.C. Fields; most likely a reference to when the real Fields turned down the role of the Wizard for the MGM film. The Wicked Witch of the West's voice is an imitation of Jonathan Winters as Maude Frickert. It helps that a man voices the Witch in this series. In "The Reunion," a former classmate of the Witch is Frankie Draculoff, a Frankenstein's Monster with a voice based off Boris Karloff (his name is a play on Frankenstein, Dracula and Karloff). The Oz Motors salesman in "The Wizard's Tail Fins" has a voice that's clearly an imitation of Frank Nelson. Of Course I Smoke: Seen in "Get Out the Vote", when Socrates enters politics to run for head of Public Works. One politician stereotype he attempts to follow is to smoke a cigar; he initially says, "I can't let them know I've never smoked before," before taking a drag and violently hacking. Our Dragons Are Different: Desmond Dragon falls into this trope; he doesn't enjoy doing anything bad, and usually will reluctantly follow the Wicked Witch's commands, but ends up not carrying them out. Pick a Card: This is the Wizard's favorite magic trick to perform. Plucky Girl: Dorothy, who borders on Fearless Fool at times. Pop the Tires: The Wicked Witch does this in "The Count" by laying tacks on the Yellow Brick Road. Porky Pig Pronunciation: Done with Robby the Rubber Man on occasion, who has a terrible stuttering Speech Impediment. Shapeshifting: Both the Wizard of Oz and the Wicked Witch of the West are capable of this. Spot the Impostor: Played straight in "Double Trouble", when the Wicked Witch transformers herself into a clone of Rusty to cause trouble. The fake Rusty can be told by a small wart on top of "his" nose. Stock Footage: The show features a lot of it, such as reusing the same walk cycles for characters frequently, the same animation of the Wicked Witch of the West cackling, and quite a few other bits of animation get reused as well. Story Arc: In addition to the two-part pilot episode (done in a serialized fashion similar to Rankin/Bass's other show of the time, The New Adventures of Pinocchio), there are four episodes that are linked together involving characters trying to get Dorothy back to Kansas: "The Big Shot" (where Rusty tries firing Dorothy out of a cannon), "On the Wing" (where Socrates and Dorothy attempt to fly in a pelican to Kansas), "To Stretch a Point" (where Socrates and Dorothy try it again), and "The Flipped Lid" (where Dandy Lion tries growing a very tall tree to take her there, but it then becomes an Amnesia Episode). Suddenly Voiced: The Wizard has concocted a drink to make Munchkins, whom normally babble high-speed gibberish, talk eligibly, as seen in "The Sound of Munchkins" and "Be a Card." But each time it's happened, things go awry, and so the Wizard reverses it. Temporary Love Interest: Dandy Lion has a crush on a lioness named Lulabelle in "Mail-Order Lover." He lies in a letter to her that he is brave, strong and rich. So when Lulabelle comes to visit Dandy, he has the wizard make it look like Dandy is all those things. Later, Dandy feels guilty and confesses the truth, though Lulabelle doesn't mind that he is a coward and weak, she leaves Dandy among finding out he's not rich. Thanksgiving Episode: "Gabe the Gobbler". The Tooth Hurts: Seen in "Down in the Mouth," when Dandy Lion gets a toothache and fears having the Wizard play dentist on him. The Unintelligible: The Munchkins, in many cases. Though some characters are able to understand them, depending on the plot, and if said Munchkin's voice is slowed down in a digital audio editor, the audience can then understand them. Vampire Vords: The titular character in "The Count," whom is obviously based off Bela Lugosi's portrayal of Dracula, and the Wicked Witch is in love with. Vocal Evolution: The Wicked Witch of the West had a higher-pitched voice in the earlier episodes. Beginning with "The Movie Maid", her voice was lower and breathy (as an imitation of Jonathan Winters's Maude Frickert character), but her high-pitched laugh is still used. Voices Are Mental: An interesting version occurs in "Free Trade." Rusty Tinman decides to trade his brain to Socrates in exchange for his heart. Once Socrates has Rusty's brain, he speaks in Rusty's voice (as expected), but when Rusty has Socrates's heart, he has Socrates's voice. They eventually find they do not like acting like each other (i.e Socrates being a bully and Rusty being a gullible Cloudcuckoolander), so they trade back, and their voices return to normal.